St John's Church in Adlington held a special dedication for Adlington's new war memorial on Sunday 3rd November 2012. Members of the British Legion joined Parish Councillors and the congregation for special dedication ceremony at St John's Church for Adlington's new war memorial. Adlington did not previously have an outdoor War Memorial. 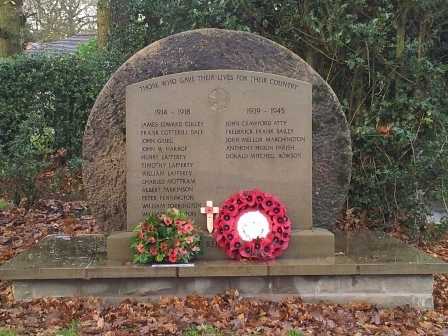 The Parish Council commissioned the new memorial which incorporates an historic mill stone and is sited at Holly Green which is at the junction of Roundy Lane and Brookledge Lane, near to St John's Church. There is still a wooden plaque within St John's Church itself which also lists the names of Adlington's war dead. Local resident Mike Akerman has undertook extensive research on the names to be included on the new memorial. Mike has also prepared a reference booklet about the men behind the names on the memorial. For more information please contact the Clerk.